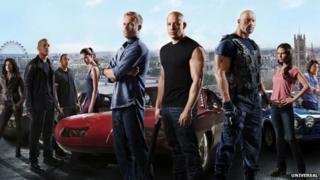 How long is the runway in Fast & Furious 6? Action movie Fast & Furious 6 has been a huge global success - but it would take a very long runway to make one climactic scene a reality, finds the BBC's Ben Carter. In the scene that we're interested in, a huge cargo plane lands on a runway where it is chased by fast cars and furious men and women. Some cars manage to drive on to the plane through the cargo doors at the back. The plane carries on taxiing for several more minutes before trying to take off. At which point the furious men use their cars to pull down the wings to stop the plane flying away. It's an incredible 13 minutes' worth of high-speed action, but a problem occurs to many people after they've left the cinema. How long is the runway if people are driving on it for 13 minutes at speeds fast enough to keep up with a plane that is landing and taking off? The key to this calculation is the speed of the plane. Pilot Ian Hollingworth told me the speed for a large cargo plane coming in to land would generally be 140-150mph (225-241km/h). As far as calculating the speed of the plane after it has landed - that's difficult because, as Capt Hollingworth told me, once you land and decelerate, it's not possible to then speed the plane up and take off again - as happens in the film. But actor The Rock did say in an interview that the cars were travelling at 115mph (185km/h) when they drove on to the plane, so we did some calculations based on that. We also needed to know the take-off speed. Capt Hollingworth added: "It might take you somewhere around about a minute to get to the correct speed - again, around 150mph." The cars speed up and slow down during the 13 minutes and we've used a very conservative estimate that they were travelling at an average speed of 120mph (193km/h). That's two miles every minute, which makes the runway 26 miles (42km) long. On the other hand, it's a movie - so when the hero is grappling with the villain on the plane, the film can cut from the fight to what is going on outside on the runway. Both these things are probably happening at the same time. So we looked at the sequence carefully and recalculated how long the plane is actually on the runway. It is difficult to be exact, but we think it is only for nine minutes. Our best estimate after calculating plane speed, car speed and simultaneous action sequences is that the runway is 18.37 miles (29.6km) long. Which is still very long when you consider the longest paved runway in the world is the Qamdo Bamda airport in China, at around 3.5 miles (5.6km).